Last Thursday was an exciting night for Eat’n Park. That’s because renowned artist Burton Morris unveiled a very special painting: his own rendition of our Smiley Cookie! We wanted to do something really special for Smiley’s 25th birthday, and when we asked Burton to be involved, he was thrilled. He revealed his bright, cheerful design at Pittsburgh’s Andy Warhol museum – a fitting location, because not only has Morris’ work been compared to Warhol’s, but like Warhol, Morris is also a Pittsburgh native. 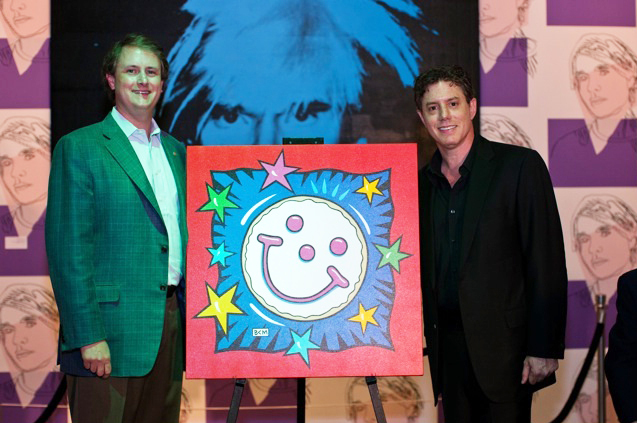 Our CEO, Jeff Broadhurst (left) with Burton Morris at the Andy Warhol museum, where Burton unveiled this special Smiley artwork. Burton developed the design over a three-month period as he translated Smiley into his signature “post-pop” style. His artwork is known for its bright colors and energy – much of it portraying images that people relate to in everyday life. He first gained national attention in the mid-1990s when his artwork was chosen to hang on the set of the NBC hit television series “Friends.” Over the years, his artwork has been selected for the 76th Academy Awards®, the Paris World Cup Soccer Games, the 2004 Summer Olympic Games and the 2006 Major League Baseball All-Star Game. Watch Burton Morris as he creates this very special piece! Wow! Burton does it again. What a perfect subject for his cheerful colorful style. Can't get enough of B.M.